What is CSA stand for? CSA stands for Community Supported Agriculture. It is a locally-based farming and distribution model for members to join up with a farm and receive shares of the bounty throughout the season. Why join the Sawmill CSA? I will be away during one of the pick-up days, can I pick my share up another day? Yes, please give us a week’s notice. You can either double up for the next distribution or have a friend get your share. What happens if I miss a share without giving notice? Leftover shares are considered forfeited. For members in Florence, we can often leave leftover shares at the farm for you to pick-up the following day. We have pickup locations all around New England and Brooklyn. Check out each regions page fore information on each site: Pioneer Valley || Brooklyn || Boston & Worcester. All of our sites are located at different host shops, farmers markets or farms that generously offer their space for our members. It’s important to pick up your share within the time slot indicated on our site. Bunch sizes vary depending on the herb, quantity available and part of the season. On average each herb bunch retails at $5. To help you plan we will indicate approximate size of each on the herb selection page. Generally after the first distribution members get the general idea of what constitutes the different size bunches. I don’t know what to do with the herbs and I’m afraid they will go to waste! We suggest starting with a half share if your new to using herbs and want to dip your toes in. 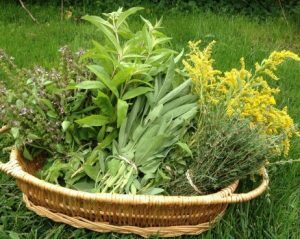 We provide an e-newsletter and a private facebook group with lots of recipes and advice on what to do with your herbs – everything from food, cocktails, teas, tinctures, salves and more. If at any point you get overwhelmed, you can easily hang up your bunches of herbs to dry and use them later (just don’t forget to label them!). What herbs are offered to the CSA? We grow and wild-harvest a large variety of herbs for the CSA. We grow many less common medicinal plants as well as the more common herbs for culinary uses. Shares consist of flowers, leaves, stems and roots! Nearly all of the herbs listed on our “Herbs We Grow” page are available to the CSA during the season. If you have questions about specific availability, email us. A full share has pickups every two weeks during the season while the half share is once a month. You still get to pick 5 herbs each time regardless of the share size. How do I choose my herbs? And can I add on extra herbs throughout the season? For an example of the online checkout system we use, go to this page. Before every share we send out an e-newsletter and then you can choose your five herbs. If you would like to add on extra herbs you can do so by choosing the “Bulk Item” option for each herb after you’ve already chosen your first five herbs. You can pay easily with credit card or send us a check. Do I have to join the CSA to get fresh herbs from Sawmill? If you know that the CSA model isn’t right for you but you still want herbs you can choose to buy bulk herbs during the season instead. We charge a small delivery fee for each order and we will have a calendar up so you can be sure you’re available to pick up the week that the CSA is at your desired pickup location. CSA members also get first choice if we only have a small quantity of something available.